Slow lorises are YouTube stars. A quick search on the website will greet you with several videos of these endearing little primates–from a slow loris nibbling on rice cakes and bananas, to a loris holding a tiny umbrella. Lady Gaga, too, tried to feature a slow loris in one of her music videos. But the loris nipped her hard, and she dropped her plans. This was probably for the best, because the bite of a slow loris is no joke. Being the only known venomous primate in the world, its bite can quickly turn deadly. And George Madani, a wildlife biologist, is testament to this. On 8 April 2012, Madani was on a wildlife surveying trip in Malaysian Borneo, when he encountered a Kayan slow loris (Nycticebus kayan) on a mango tree. But curiosity became his undoing as the loris bit him onthe finger, which led to a series of agonizing events. Initially just painful, the effects of the bite soon manifested themselves into a full-blown anaphylactic reaction. His mouth swelled up, his chest and abdomen hurt, he felt nauseous, short of breath, weak and agitated. Luckily for him, the remote location he was traveling in had a clinic stocked with adrenaline to alleviate his condition. Figure 2 After the bite, the patient showed extreme swelling, worsening over time. 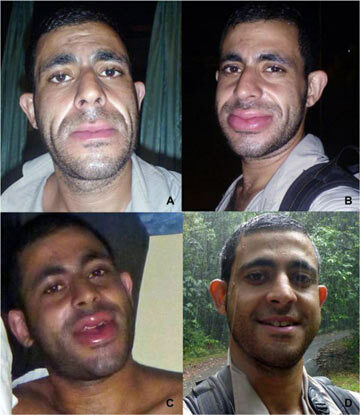 (Panel A) 33 minutes after the bite; (Panel B) 54 minutes after the bite; (Panel C) one hour and 39 minutes after the bite; and (Panel D) one week after the bite (photos by G. Madani). Madani’s case was reported in the Journal of Venomous Animals and Toxins including Tropical Diseases earlier this month. According to authors Madani and Anna Nekaris, the director of Little Fireface Project at Oxford Brookes University, Madani’s case is the second medically evaluated case of anaphylactic shock by a slow loris. This is also the first reported case from a Kayan slow loris. These are, however, not isolated cases of deadly loris bites. There are numerous unpublished accounts and anecdotes of indigenous local populations who attest to the potency of the venom, according to the authors. There have also been similar unpublished reports from North American and Asian zoos. Despite their ability to inflict painful and sometimes even fatal bites, slow lorises are increasingly getting embroiled in an illegal pet trade fueled mostly by their rising Internet popularity. The authors hope that Madani’s harrowing experience will deter people from keeping these venomous primates as pets. However, according to Nekaris, people have expressed concerns that this story could increase the incidences of people cutting out the teeth of lorises before selling them as pets. And this could make the situation worse for these little primates, as often the animals don’t survive the operation. So what happened on that fateful day of 8 April 2012? Madani tells mongabay.com below. 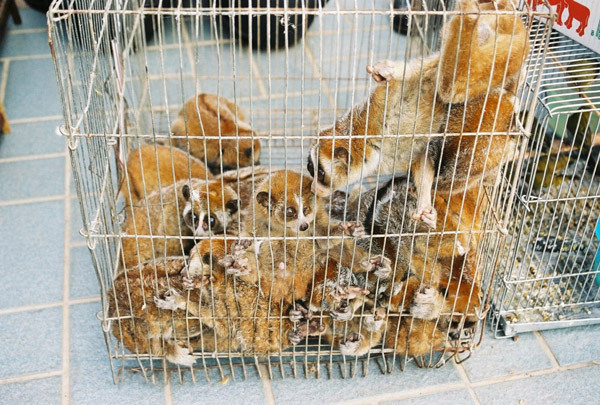 Slow lorises confiscated in Thailand in the illegal pet trade. Photo by: The Little Fireface Project. Mongabay: Can you describe the series of events that led to the slow loris bite? George Madani: I was travelling through Malaysian North Borneo with my friend David Nelson. It was a trip heavily focused on finding and documenting wildlife out of personal interest. At the time we were travelling in the Mulu district of Sarawak, an area only practically accessible by air. The loris was found on our first night, just off the road in a mango tree in regenerating secondary forest not far from a farmhouse. After first seeing the eye shine of the loris we walked off the road towards the tree where we caught a fleeting glimpse of the nocturnal primate before it disappeared back amongst the leaves. My curiosity was aroused and I climbed the tree for a closer look and in an effort to get a token photo. It was not my intention to try and catch the animal. Whilst in the tree, the weight of my body moving on the branches caused the loris to fall out after it had retreated to the outermost branches. Once it was on the ground I jumped out of the tree to try and catch it so as to have a closer look at it and return it to the tree. It had raised its arms over its head in what I know now to be a defensive posture. I turned it onto its belly so as to grab it from behind and I gripped it in what I thought would be a secure restraint. This proved futile when it then turned its head in my hand and bit me on the finger. It was a very painful bite and the loris was reluctant to let go. I had to forcibly remove it by pulling at its head. It held on for at least 30 seconds. As a wildlife biologist I have inadvertently been bitten by a variety of species, but the loris took the cake when it came to being the most painful. The reaction was almost immediate. As soon as I dropped the loris and straightened my back, I began to feel the onset of paresthesia [a numbing/tingling sensation] in the right side of my body. By the time I had walked back to the road I knew something was happening to me. I then had a vague recollection that loris were venomous which I had overlooked in my initial enthusiasm and curiosity when first sighting it. Scientists collecting venom from a slow loris for study. Photo by: Andrew Walmsley. 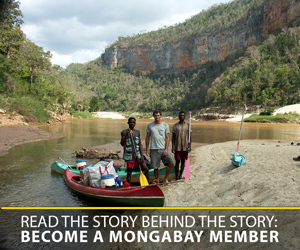 Mongabay: How far was the nearest clinic, and how did you go to the clinic? George Madani: It took about 20 minutes to get back to my room. By this stage I knew that I was undergoing anaphylaxis. My face was already swelling considerably and there was serious concern that my throat would close up. We roused the lodge manager in the vain hope that they had an EpiPen. Suffice to say they didn’t have one. The staff thought quickly enough to bundle me into a van and drive about 5-10 minutes down the road to a clinic. It was somewhat ironic that given how remote the location we were in, the tiny village had its own clinic to service the community. During the short drive I was more concerned with being reprimanded for my actions rather than be concerned about the fact that my head was swelling at a rapid rate, to the point where my ears felt like they do when you rapidly change air pressure. Everyone in the van was quiet and somber. But the second we pulled up outside the clinic, and I got out, they all burst into laughter at the sight of my face and huge lips and called me Pala Batu which means stone head. I understood that to mean that I was a fool. Mongabay: What’s the take-home message? George Madani: Since the loris bite I always carry an EpiPen. Lots of other animals can induce anaphylaxis including ants, bees, and wasps. If I don’t need it for myself then there’s still a chance that I could apply it to someone else in need. If I hadn’t been so close to readily available medical aid I don’t know what would have happened. For the first hour-and-a-half or so post bite, despite the swelling, I felt okay. But very suddenly my condition began to deteriorate, and I went from laughing and joking to being in considerable pain within a matter of minutes. If I hadn’t received adrenaline then, I would have been in for a very rough time. There was every possibility that I could have died. Being in a clinic did give me comfort, knowing that a shot of adrenaline would reverse the symptoms. However, if I hadn’t been near medical aid I think it would have been a truly harrowing and frightening experience. So the chief lesson is to leave lorises ALONE!!! This encounter has also made me much more aware of the plight of these threatened and enigmatic creatures. It is my hope that I can use my experience to help raise awareness and to deter people from wanting them as pets. 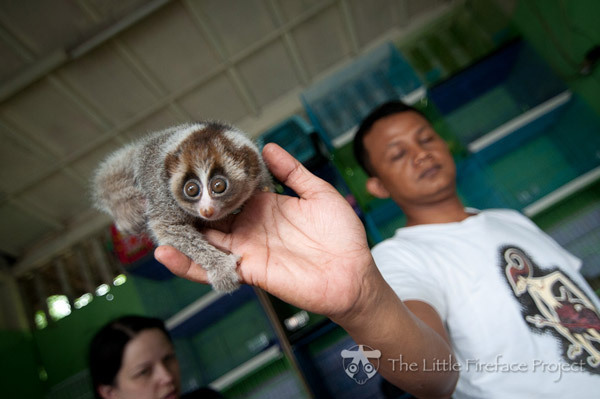 This baby Sumatran slow loris has little chance to survive. Only a few weeks old, it should live with its mother in the wild for 14 months, but instead is being sold into the pet trade, doomed to a diet of bananas and rice. Photo by: The Little Fireface Project. 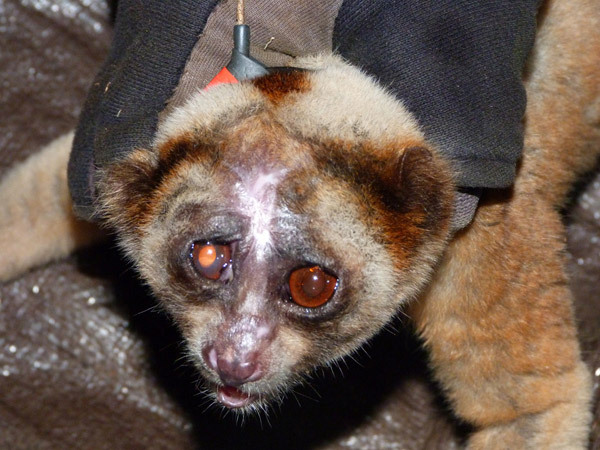 Mongabay: Do you think your story can help deter illegal pet trade of slow lorises? George Madani: It’s all about raising awareness for the plight of these poor persecuted creatures. Through Anna’s great conservation work and promotion of the cause people are becoming more aware as to the huge cost that YouTube videos and social media have on these species – that liking and sharing a video of an animal that you think is cute is actually promoting its suffering, and encouraging the illegal trade in poached wildlife. If these reasons aren’t enough for people to not want to keep a loris as a pet, then hopefully my experience (and photos) will put the fear of God into them to stop them from desiring them as a pet. The images are graphic and despite being embarrassing I am willing to share them so that they generate attention and awareness to the plight of the slow loris. 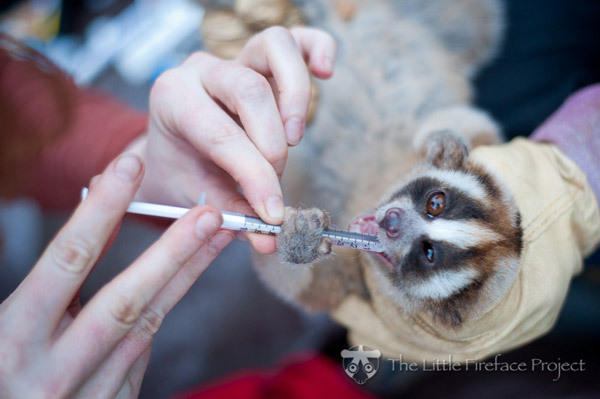 (09/29/2014) The bite of a slow loris can be painful, and sometimes even lethal. After all, this cute-looking YouTube sensation is the only known ‘venomous’ primate in the world—a trait that might have strangely evolved to mimic spectacled cobras, according to a recent paper. Mimicry in mammals is rare. But anecdotal evidence and studies in the past have noted the uncanny cobra-like defensive postures, sounds, and gait in slow lorises. (05/05/2014) In 2004 and 2012, scientists recorded rare encounters between two very different primates: southern Bornean orangutans (Pongo pygmaeus wurmbii) and Philippine slow loris (Nycticebus menagensis). But in neither case did the Bornean orangutan appear to attempt to kill the slow loris for consumption, which Sumatran orangutans are known to do, albeit very rarely. (02/25/2014) Last week, the musical artist, Lady Gaga, was ‘nipped’ by the world’s only venomous primate, a slow loris, in a misguided attempt to use the animal in a new music video. After it bit the musician, the idea of using the primate in the video was dropped. This was just as well, according to loris expert Anna Nekaris, who says that slow lorises have become increasingly endangered worldwide by the illegal pet trade after people have seen them on YouTube videos. (09/23/2013) On Friday R&B singer, Rihanna, posed in Thailand with a slow loris, an endangered primate that is often illegally touted on the streets of Southeast Asia by pet dealers. The picture, which the celebrity shared on instagram, went viral, and over the weekend Thai police arrested two men—one 20 and one 16—who allegedly provided the slow loris to the Rihanna for the impromptu photo.